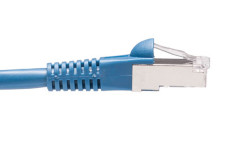 This Category 7 cable is double-shielded to resist electromagnetic interference. Its RJ-45 connectors with 50 micron gold plating has molded boots for protection during installation. Cable has CM type PVC jacket.